(Montreal, Quebec) On August 8th 2009, the night before the Filipino Association of Montreal and Suburbs (FAMAS) elections, many gathered at the Chalet Kent in support of Filipino youth issues by endorsing candidate Neil Castro. 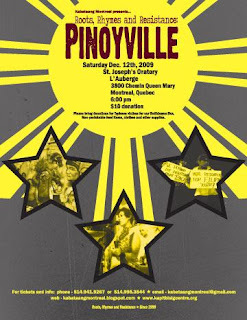 As a Board Member of the Kapit Bisig Centre, Castro has been a long-time youth organizer with Kabataang Montreal, a Filipino youth organization. "Since 2004, I have been advocating for Filipino youth rights. Now, I want to bring these concerns to the forefront of the Filipino community by running with Lingkod Bayan's presidential candidate Mel Domingo," Castro stated during last night's campaign concert. These local young artists were in support of raising the engagement level of Filipino youth within the Montreal community. The lineup really highlighted the diversity of talent among Filipino youth: there were singers like Jennifer Flores and Cherylyn Toca; a Filipina cellist , Christina Gavino; hip hop artists like JP a.k.a. Seeko, Jaycee Pimentel, DJ Panda Zal. There was a spoken word/song performed by Jillian Sudayan and Julie Nieto, both members of Kabataang Montreal. Sinag Bayan Cultural Collective performed a drum instrumental and a song led by Jillian. Even Indonesian rock group Orchid Blooms came out in strong support of the youth movement. Finally, Neil Castro closed out the show with a motivating rendition of After Image's ‘Next in Line’. FAMAS, the oldest community centre in Montreal, elections are held bi-annually to elect its President and Board of Directors. The results of the election will be announced tomorrow. KABATAANG MONTREAL has been organizing for change in our community since 2000, with Neil Castro as the current Secretary-General. He has been a member of KM since 2004. We will continue to raise awareness of the rich history, work and contribution of the Filipino youth in our community. We will continue to work with other, often overlooked, sectors of the Filipino community, namely students, women, workers and temporary workers, professionals and seniors. We will continue to address the pressing issues affecting our youth such as the high drop out rates amongst our youth, racism and discrimination and economic marginalization. We will continue to work to unite the entire Filipino community of Montreal & suburbs towards our settlement and integration and full entitlement in Canadian society. VOTING Neil Castro for FAMAS director, IS supporting the work of an organization which has been educating, organizing and mobilizing the Filipino community for almost a decade. Neil Castro is a member of Team Lingkod Bayan with Mel Domingo as presidential candidate. KAPITBISIG - MAGKAISA para sa Kabataang Montreal! WE NEED CHANGE! YES WE CAN! VOTE NEIL CASTRO!